ALLEGRA BOVERMAN/Staff photo. Gloucester Daily Times. 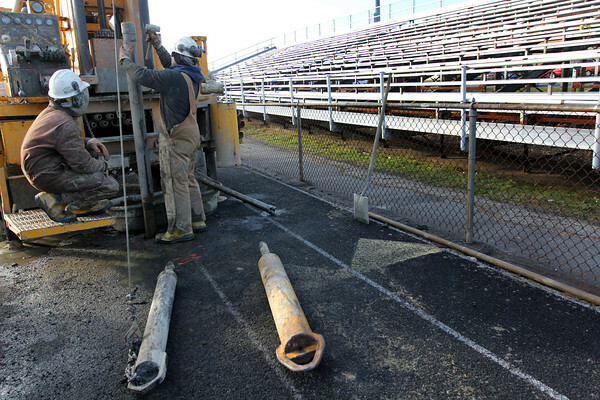 Gloucester:New Hampshire Boring geotechnical drillers Ken Smith, left, and Shawn Burto, take soil samples from the track and field at Newell Stadium at Gloucester High School on Monday afternoon. They are working with CDM, of Cambridge, the project engineers, to determine the soil density of the stadium to determine how stable the ground is for the stadium, track and field renovation. They are on-site all week gathering and then testing soil at the site. ow stable the ground is for the stadium, track and field renovation. They are on-site all week gathering and then testing soil at the site.